Starlite opens at 20.00 p.m. every day, from Monday to Saturday. WHERE DOES STARLITE TAKE PLACE? Starlite Marbella takes place at a quarry (the Nagüeles Quarry), an open space surrounded by nature, which is located at the high part of the Sierra Blanca Urbanization, in the Istan highway. It is 3.5km from the centre of Marbella (8 minute car ride) and 15 minutes from Puerto Banús. HOW CAN I GET TO STARLITE? WHERE CAN I FIND THE FESTIVAL’S PROGRAMME? In the Starlite web you can always find all our programming for this 2019 edition. If you don’t want to miss anything, go download our new mobile App (iOS, Android), with information about the concerts and much more. Once you are in the venue, you can easily find there hand programmes with every session at Starlite Festival. Also follow our social media profiles to have access to our latest news: Facebook, Instagram y Twitter. AUDITORIUM: There is a programming of 30 concerts of national and international artists. Check it here. STARLITE SESSIONS: A new concert cycle, which will take place at the Sessions stage, with a reduced capacity. Check it here. GOLDEN SESSIONS: Every Monday, performances of the best international electronic DJs take place at the Sessions stage. Check it here. DJ SESSIONS: Every day, the best performances of the best first-level national DJs at the Sessions stage. Check it here. SESSIONS AREA: It has a parallel and previous programming to the auditorium concerts. IS THERE A MAP WITH ALL THE ACTIVITIES IN THE VENUE?  Yes, you can check it here. CAN I FIND INFORMATION POINTS IN CASE I NEED THEM? Yes. A Starlite stand can be found at the entrance of the venue to solve any question or attendance you might need. You can also send an email to info@starlitemarbella.com. WHAT MAKES STARLITE SO SPECIAL? The capacity: As it has a reduced capacity (3.000 seats), the spectator has the opportunity to see the artists who normally perform at large capacity locations of about 20.000 to 50.000 people. This not only allows a closer feeling with the artist, but also permits the artist to see the spectators and interact with them. At Starlite, the furthest point from the artist is 39 meters away, and the closest is only 2 meters. CAN I GO TO STARLITE ONLY FOR THE DJ SESSIONS? Yes. If you want to attend Starlite Festival only for the Dj Sessions that take place after the main show, you can do it by purchasing an entrance ticket. Its price varies depending on the session. The entrance to the Auditorium and Sessions area to assist a concert is attached to the price of each concert. CAN I ENJOY ALL THE ACTIVITIES AT THE SESSIONS STAGE WITH MY CONCERT TICKET? Yes, with an entrance to a concert you can access any area at Starlite until its closure time that day. CAN I EXIT AND ENTER THE FESTIVAL WHENEVER I WANT? Starlite does not give a stamp to enter and exit. Regarding the Auditorium concerts, with the entrance you can go out into the Sessions area and enter the auditory again whenever you want. No. Access to concerts with photo or filming cameras is not allowed. However, the use of mobile phones is allowed. No. Starlite Festival already has its own gastronomic areas. Check our delicious offer here. ARE ATMS AVAILABLE IN THE PREMISES? CAN I MAKE PAYMENTS WITH CREDIT CARDS? There are no ATMs, but you can pay with credit cards: Visa, MasterCard and American Express. Starlite counts with the medical assistance of Asisa. You can click on the map and locate them. Starlite has an information and pick-up point for missing items inside the venue. All lost property is turned in and given out there. For any lost property related enquiry, you can contact our team at: rrpp@avory.net. IS STARLITE A NON-PROFIT PROJECT? WHAT IS THE DIFFERENCE BETWEEN STARLITE AND STARLITE GALA? Starlite is an entrepreneurial project. However, Starlite Foundation is a non-profit organisation created by Starlite, which is dedicated to the managing of resources of Starlite’s social work. Apart from other activities which Starlite carries out throughout the year, Starlite Foundation executes a night dedicated to philanthropy on a yearly basis and inside the festival’s time-period: the Starlite Gala, in which Antonio Banderas and Sandra García-Sanjuán are the hosts. Starlite Gala has become Spain’s most important charity gala. The 100% of what is collected along the night is distributed throughout the Starlite Foundation among different foundations, such as: Niños en Alegría, Lágrimas y Favores, Cudeca, Cáritas, Corinto, etc. DO CHILDREN HAVE ACCESS TO THE VENUE? Children can be at the venue (over the age of 3 years old and always accompanied by an adult) only until 00:00 am, which is the time when they have to leave the venue. IS THE ACCESS ADAPTED TO PEOPLE WITH REDUCED MOBILITY OR SPECIAL NEEDS? Yes. Access to Starlite is adapted and there are enabled areas close to the stage at the Auditorium. For people with special necessities and the people with them, please send us an email with all the information to: info@starlitemarbella.com. DOES STARLITE HAVE A SHOPPING AREA? Yes. Everyday from 8pm to 1:30am, Starlite Festival attendees can enjoy our shopping area that includes 21 stands with the ultimate brands in fashion, leisure, cosmetics, accessories and technology. HOW CAN I BE INFORMED WITH THE LATEST CONFIRMATIONS AND STARLITE NEWS? Starlite publishes all its news on the web page and also on social media (Facebook, Twitter, Youtube, Instagram). Subscribe to Starlite’s weekly newsletter to receive privilege information and the latest news. Also, download our new mobile App (iOS, Android), to always have with you the programme, concerts information and much more. If you want to make a claim or complaint, you will find the corresponding formularies at the Starlite box offices. You can also make it through mail at: rrpp@avory.net. WHAT IS THE BEST TIME TO ARRIVE TO STARLITE? We recommend you to come at least one hour before the show starts, so you can live a fully Starlite Experience. I'M A PHOTOGRAPHER / JOURNALIST FOR AN IMPORTANT PUBLICATION / BLOG. HOW DO I MAKE ARRANGEMENTS FOR A PRESS PASS? All photographers and journalists from any publication interested in attending the festival for professional purposes must ask for their pass in our Press Room. ARE YOU HIRING WORKERS FOR THE EVENT? Starlite convenes every year, with Jobandtalent, a recruitment event for the festival in Marbella. If you are interested in working with us, send us your application here. If you have any collaboration proposals or suggestions related to our gastronomic offers, please email us to info@starlitemarbella.com. WHO DO I TALK TO IF I HAVE ORDER QUESTIONS OR HAVE ANY PROBLEMS WITH MY TICKETS? For any problem related to your tickets for Starlite Festival, please contact us to tickets@avory.net. ARE PAYMENT PLANS AVAILABLE? CAN I DIVIDE MY ORDER INTO MULTIPLE PAYMENTS? Yes. Starlite payment plan allows splitting your payments into four times with no interests added. To enjoy this plan, you only have to choose the payment method at the moment of your purchase. DO YOU HAVE A LIST OF WHAT IS AND ISN'T ALLOWED? It is completely forbidden to bring inside the venue any object not allowed by the current regulations and that might be harmful or affect anyone’s safety, up to the organization. The nearest train station to Marbella is María Zambrano (Málaga). You can also travel to Marbella through Málaga Airport and Jerez Airport. WHERE CAN I GET MY TICKETS FOR STARLITE FESTIVAL 2019? 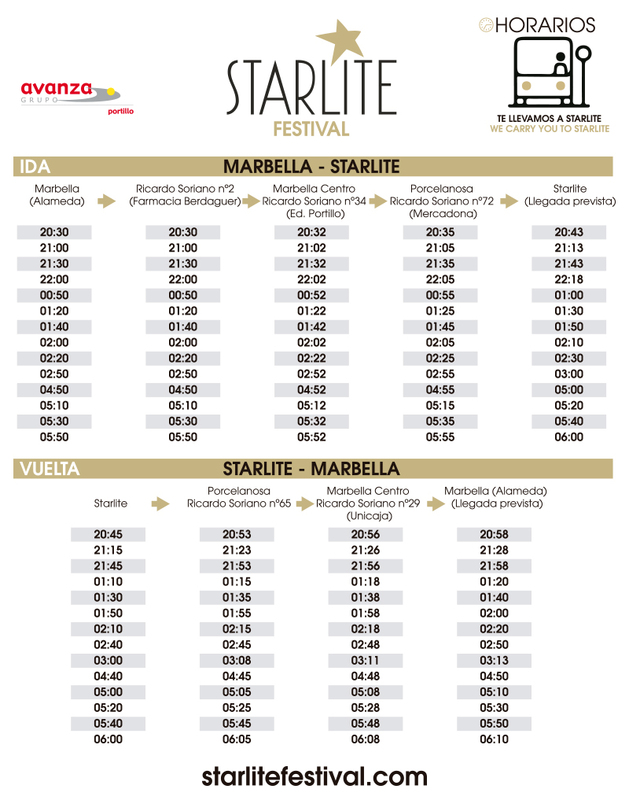 You can get your tickets through our website, www.starlitemarbella.com and our new Starlite Festival official app (iOS, Android). We also have points of sale, located in the train station of María Zambrano (Málaga), Puerto Deportivo (Marbella) and Puerto Banús (Marbella). You have as well at your disposal: Entradas.com, Ticketmaster, Ticketea, El Corte Inglés, Atrápalo, Fever y Renfe.